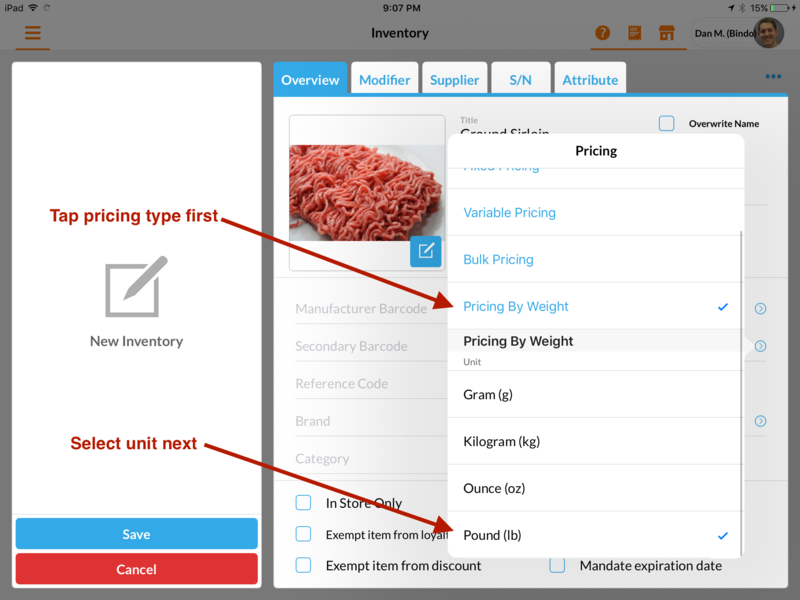 To set price by weight navigate to the Inventory page in the Bindo app and locate the product for which you'd like to set the price. Tap on the three blue dots in the top right corner and tap "Edit". Tap on the blue arrow to the right of the "Price" field, tap on "Pricing By Weight", and finally select your unit of measurement (see image below). Tap outside of the "Pricing" box to return to the Inventory edit page, and tap "Save". 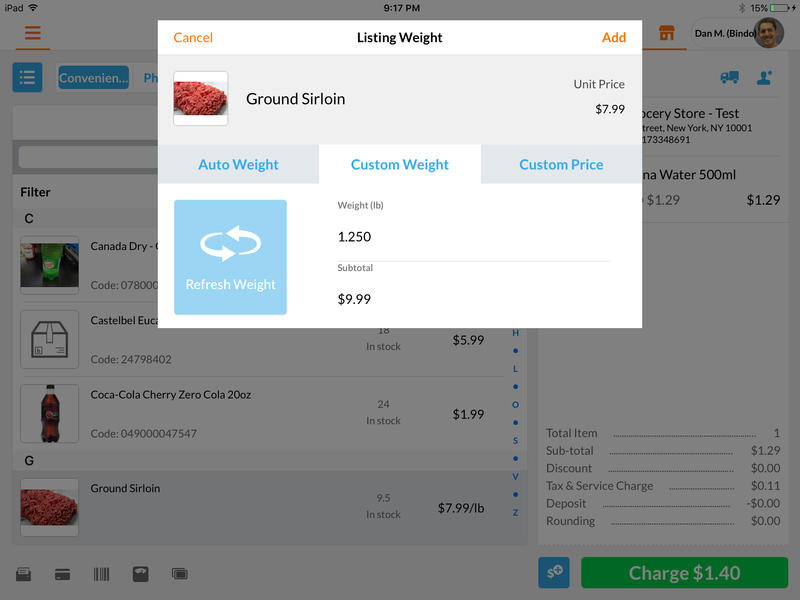 When you sell an item that has price set by weight a weight entry prompt will appear on the register screen. If you have an integrated scale connected the weight entry prompt will show the "Auto Weight" tab automatically and weight will be retrieved from the scale. If you are not using an integrated scale type the product weight into the Weight field. Tap "Add" when the weight has been entered. Once you enable "Decimal Inventory Quantity" Bindo will automatically track the weight of an item sold and deduct that amount from current inventory. To enable Decimal Inventory Quantity go to Settings > Add-Ons, tap on the three blue dots in the top right corner and tap "Edit". 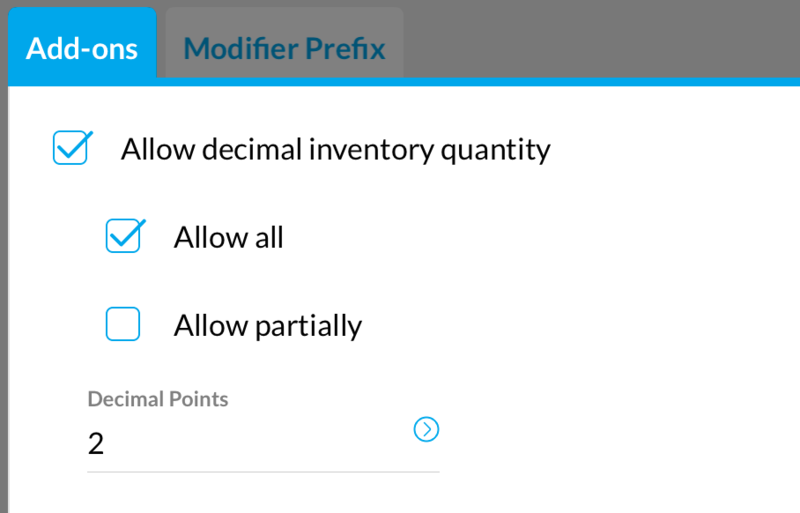 Find the checkbox "Allow decimal inventory quantity" and tap to check it. Allow all means all products will be tracked with decimal units. Allow partially means only selected products will be tracked with decimal units. Select the number of decimal points which you would like to use: two, three, or four. Go to the Bindo Dashboard and under "Settings" click on "Embedded Barcodes". Click on "Edit" in the bottom right corner of the page. Check the box "Enable Embedded Barcode for by weight pricing product"
Choose the relevant Embedded Barcode type: "Embedded Price" or "Embedded Weight"
Choose the relevant number of decimal points: 0, 1, or 2.